For the longest while I disliked Tofu. I think it was because of the way it was prepared. Too bland, too fried or what not. 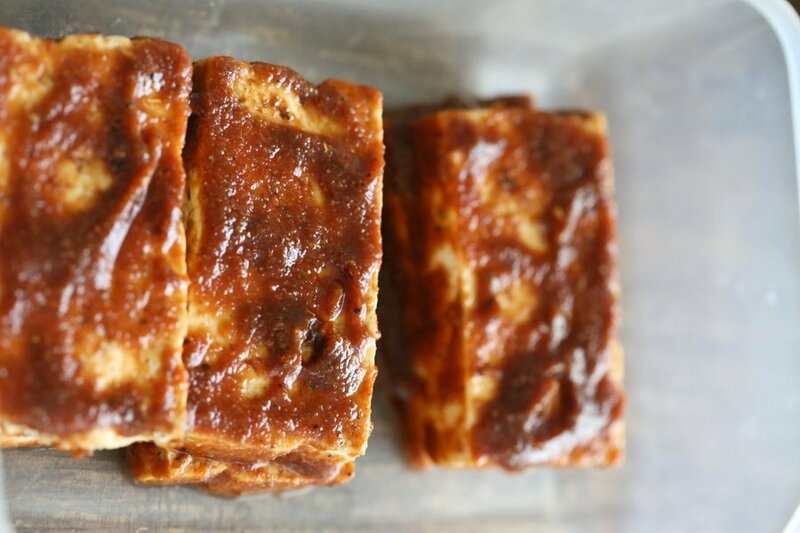 After transitioning to a vegan diet, I was faced with a challenge to figure out how to make tofu on my own so I could like it. In general, I don’t necessarily need to eat Tofu at home. There are enough beans, lentils, veggie dishes that make up our meals. But when I eat out is when the options get limited by my dislike of tofu (and broccoli). I mean think of something like a saucy Thai Cashew delight minus both, it would just be cashews and onions. ha! So once I started cooking some at home, I warmed up to this silky gelly beany slab. We eat Tofu infrequently at home, but at least the warming up has helped me be open to trying more options at restaurants. My current favorite tofu dishes come from Wedgewood II Thai in Seattle (Capitol Hill). Back to today’s recipe. 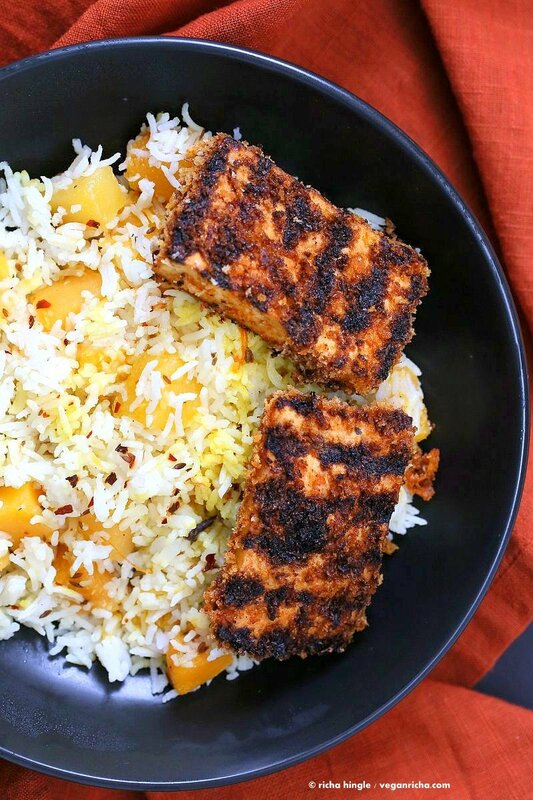 This easy crisped up tofu needs just a few minutes of active time. 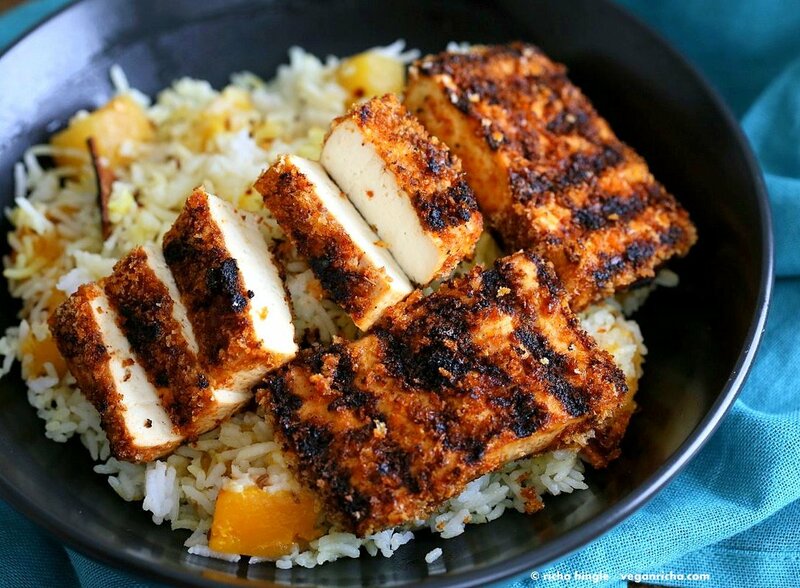 Brush the marinade on the Tofu strips and let it sit for a while, then bread and grill. Serve as side or main with a side of salad or pilaf. Pictures below with a flavorful Butternut Squash Pilaf. The ketchup, spices, soy sauce make a great marinade, which also acts like a sticky coat to keep all those breadcrumbs on. Use other sauces like bbq, and spices and herbs of choice. Brush the marinate on the tofu and let it chill. The marinade coating should not be too thick or too thin. Prepare the breading mixture. 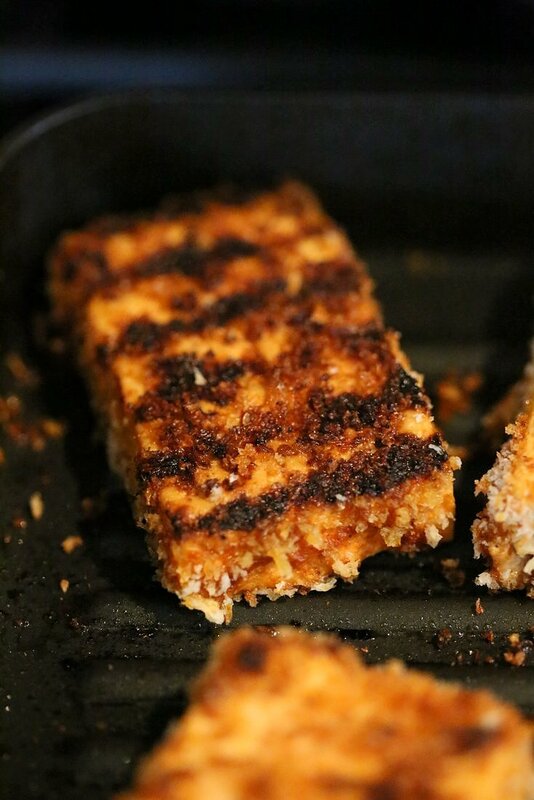 Coat the tofu strips in the breading and grill. Grill over medium heat for 6 to 9 minutes each side. Slice and serve over salad, a roasted veggie and grain bowl with a creamy cooling dressing or over butternut pilaf. Slice the slab into 6 to 8 rectangles. Press the tofu for half an hour between kitchen towels and under a heavy weight to remove excess moisture. or use Tofu press (before or after slicing). Mix the marinade ingredients. Dip the tofu in the marinade and coat all sides to make an even coating that is not too thick or too thin. Place the tofu strips in a container with a lid. Refrigerate for atleast half an hour or longer. Mix everything under breadcrumb coating. If the breadcrumbs are too large, pulse them a few times in a blender and use. Heat a grill pan over medium high heat on the stove. Brush oil on the pan and place the breaded tofu on the pan. Cook 7 to 9 minutes each side or until brown strips appear. Serve with sauces of choice like vegan ranch or a dash of lemon, or slice and to salads, bowls, wraps, sandwiches, etc. Pictured with Butternut Squash Pilaf. To bake: Bake at preheated 425 degrees F for 30 minutes or longer until crisp, flipping half way through. 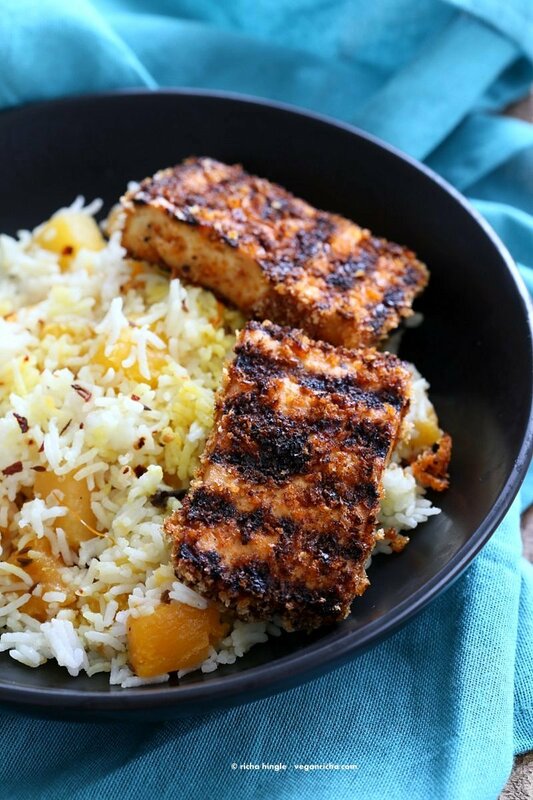 You can grill the baked tofu over high heat to get grill marks. For a stickier marinade, add 2 tsp flax seed meal and mix in. Let sit for 2 minutes, then coat tofu in the marinade. This looks very flavorful. I will be making it this week. What brand of hot sauce do you like? I am always looking for a good one. This looks AMAZING!! Home run, Richa! I just made these for an early dinner, on a bed of rice, with a side of your easy green beans…. delicious!! Thank you for the recipe. Tried these today – very nice! I did the baked version but had to bake for almost 45-50 minutes to get them crispy. In the last 10 minutes, I sliced them in half to get them crisper sooner. Great recipe! Will make again- thanks Richa! Awesome! maybe there was too much moisture in the tofu or the a thicker marinade layer? Yes, slice them thinner for quicker bake time. 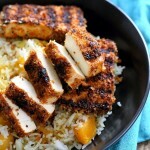 Richa, did you grill to get the marks then baked the tofu? Or only one of the cooking methods? no you either grill them, or bake them. you can bake and then grill over high for the marks. Cook these be cook in a George Foreman grill ? Great recipe! Will try it soon. I have been a long time reader of your blog and read your article in the Vegetarian Times this month. Congratulations and way to go! Made this tonight and it’s delicious! My non-vegan husband really enjoyed it as well. Thanks so much! I will try this but not cure if you buy soft or firm tofu? 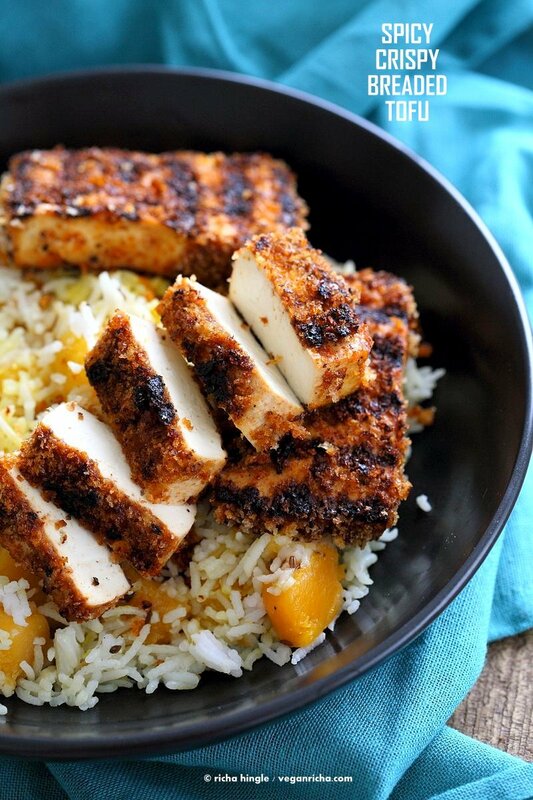 ive never tried breading tofu but this looks really good!! YUM! I’m always looking for new ways to prepare tofu. This looks simply delicious! Thanks! this one was a hit at our recent potluck! I made this last night along with the Butternut Squash Pilaf… oh my! It was incredibly scrumptious. Thanks for all the delicious recipes you provide here. I was telling one of my friends how you’re such an amazing cook! Awesome!! So glad you loved it! 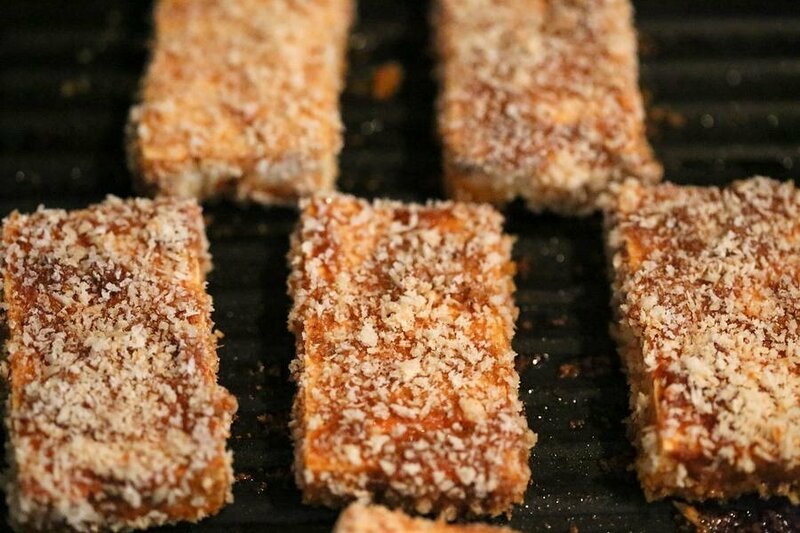 Those look like some of the best crispy tofu strips I ve ever seen. Can t wait to try them. 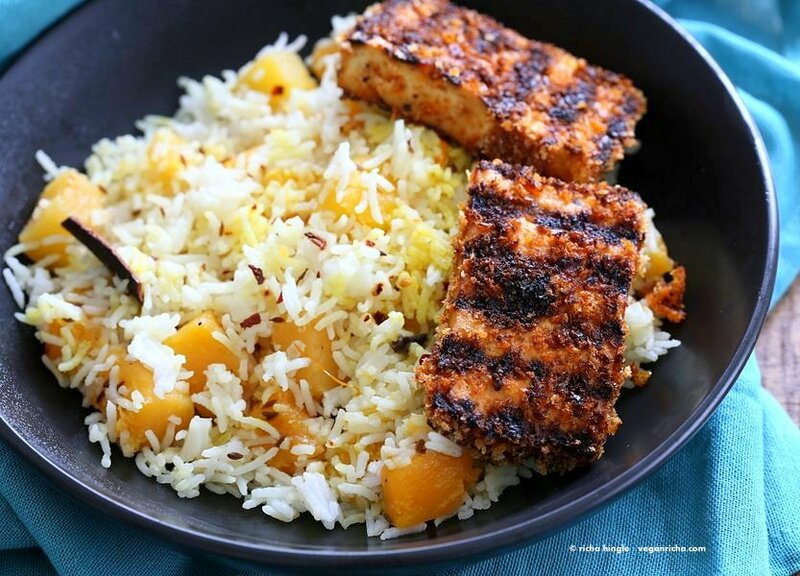 Hi Richa, I made this tonight — very nice, especially considering that it used virtually no oil! They grilled up well, got the grill marks, but I found myself wishing I had pan fried them — the breading was a bit dry. I also think I actually over-pressed the tofu; it was also kind of dry. All of that said, I would make this again, doing a couple tweaks. I’m curious — did you use fresh bread crumbs, or panko, or what? Thanks! I used panko and a thick coating of the sauce. It could be the over dry tofu or over cooking. You can soak the slices in a marinade of soy sauce + garlic powder and spices of choice for an hour or and then coat in the thick sauce, and bread and grill. I did use an oil spray on both sides, so maybe that also helped lock in the moisture. OK, that’s it — I’m going to finally invest in a spray bottle thingee for oil, because I think that is exactly what the tofu needed: just a bit more oil than I had brushed onto the grill pan. Also I’m going to get a better brand of tofu — brand I used for this tends to be dense and dry. I’d forgotten that I wasn’t going to buy it again. Thanks! Looks yummy! I am going to try this tomorrow!! I don’t have a grill, but to make this crispy, is it better to pan fry with some oil instead of baking in the oven? Have you try pan frying?? yes you can pan fry as well. I use a grill pan on the stove. which is a pan with grill marks and pan fry on that. You can use a regular pan, just keep an eye on the breading so that it doesnt burn/char completely. This is my new favorite tofu recipe. It comes out amazingly moist, which is hard to get in tofu. I even forgot to bread it, but it was still yummy. Next time I’ll try the breading. Can I put the tofu pieces in a grill sandwich maker , close the lid and prepare? Yes, that should work. Don’t press and lock the sandwich maker as that might squeeze the tofu too much, just rest the grill on the tofu slices. Hi, and sorry about the necro-comment! Frenchie vegan here. Just wanted to tell you that I tested your recipe tonight and love it to bits! Rmarlabky tasty! I was a little concerned that this might be bland. I marinated sliced and pressed extra firm tofu overnight, and grilled over a gas grill this evening: it was delicious! Just had a leftover slice in a sandwich. Home run! I’ll be making this again!